Junior Abby Barnett swimming backstroke in the 200 IM. Thursday, Sept 20, the girls swim team went up against Warren Woods Tower (WWT) for their second meet of the season. The final score was 87-82. This is a huge accomplishment because WWT is a division above the team, and even with having a diver, the girls still won. The meet started out with the A team getting second in the 200 medley relay. 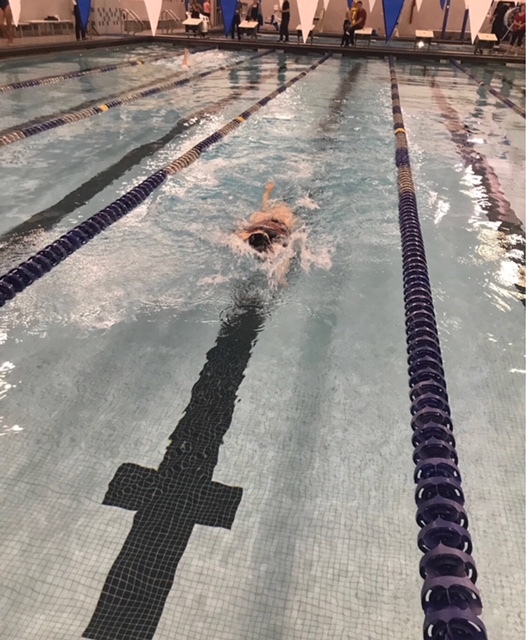 In the next event, junior Lexie Sysacure received second in the 200 freestyle. Juniors Abby Barnett and Chloe LeBlanc scored more points by being the only ones swimming. Moving on, junior Kayla Kornelson won first in the 100 free. During the 500 freestyle, Sysacure, LeBlanc, and junior Nicole Powers got second, third, and fourth. In the 200 free relay, the A team won second place. Also, the 100 backstroke was a huge success for the team, Barnett and senior Caitlin Michael came in first and second. Kornelson pulled through and received first in the 100 breaststroke. To end the night, the A team won first in the 400 free relay. This win puts the team at 2-0 for their season. Their next meet is Tuesday, Oct 2 up against Centerline.